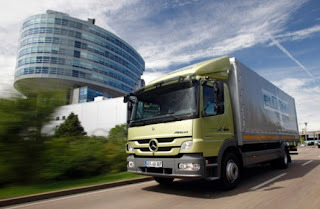 While Mercedes-Benz has made great strides in BlueTEC passenger vehicles, both SUV and sedans, the company is also working toward a cleaner, more efficient light truck. The advent of the Atego BlueTEC melds hybrid technology and an automatic start-stop feature for increased fuel economy and reduced CO2 emissions. The test fleet is making waves in Germany, and Mercedes-Benz looks for an official release sometime during 2011.